Lionel Messi and Manchester City star Gabriel Jesus have taken a break from their respective title races to star in a new advert for Gatorade, scoring a pair of wondergoals as they make their opponents sweat. The ad, to launch Gatorade's 2019 international campaign 'Make Them Sweat', features five-time Ballon d'Or winner and four-time UEFA Champions League winner Messi with City forward Jesus, facing off against a series of opponents as anyone -–or anything – standing in the way of their greatness sweats buckets. "Working on this new commercial with Gatorade was fun. I like the concept behind the ad because my opponents always provide motivation to be the best that you can be," said Messi. "Gatorade is part of our daily work and helps me to perform better." The campaign drives the #MakeThemSweat message on the pitch and beyond. The world's all-star footballers make their opponents sweat with their trademark footwork and accuracy up and down the pitch. And it's not just their opponents sweating – the patches on an opponent's jersey and the portraits of legends whose records stand in jeopardy are also seen sweating. As is, erm, the sweat. Yeah, the sweat sweats – it's a whole thing. Brooklyn-based Colombian artist Diego Patiño's illustrations bring a colourful and graphic element to the campaign, with hand-drawn illustrations that will appear across digital channels, and popular football illustrator Dan Leydon's work is included in a series of social stickers. 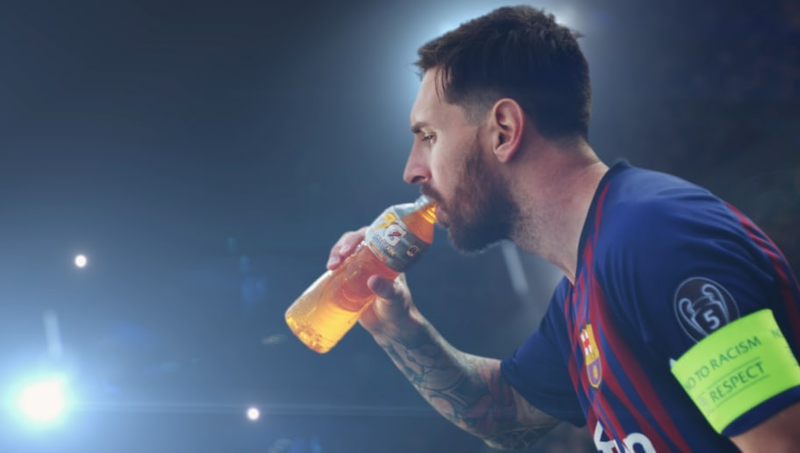 Emiliano Di Vincenzo, general manager of Gatorade International, added: "This campaign brings a light-hearted tone to a common motivator of the world's best athletes: make your opponents sweat. Gatorade is proud to work with the world's best athletes – from the pitch to the court to the track. "Gatorade is backed by the sports science research to help athletes improve and maintain their performance. And we know no matter the sport or playing field, the best athletes are the ones putting in the work and performing at their best, while their competition chases and sweats to keep up." Athletes lose more than water through sweat, and need to replace those losses to perform at their best. Gatorade is the leader in athletic performance, and contains fluids, carbs and electrolytes to help athletes maintain their athletic performance, developed in collaboration with the world's greatest athletes in all phases of athletic activity.